Wash and prepare all produce. 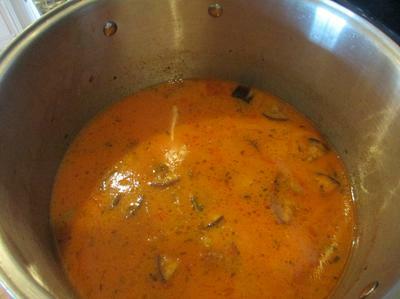 Place 4 quarts of water in large soup pot and turn on heat to Medium/High. Add potatoes and shallots, and bring to boil. Reduce heat to Medium and continue cooking. While water is being heated, sauté red onions and garlic until onions are transparent. Remove from heat and set aside. Now, to the heated water, add the rest of the ingredients, except the cheese, stirring occasionally. Add the cheese last, stirring frequently, and possibly reducing heat. Once soup has reached desired temperature, and veggies are tender (potatoes and egg plant are easily pierced with a fork), serve.